In this blog post, we try to address the three questions raised at the end of the previous blog post. The first issue was to figure out how to process the sound using easily accessible tools in the absence of the exact software used by Braxton Boren. In this regard, we discovered that the software Audacity actually allows one to make modifications to existing soundtracks by altering the waveform of the audio signal that is used as the input to the software. 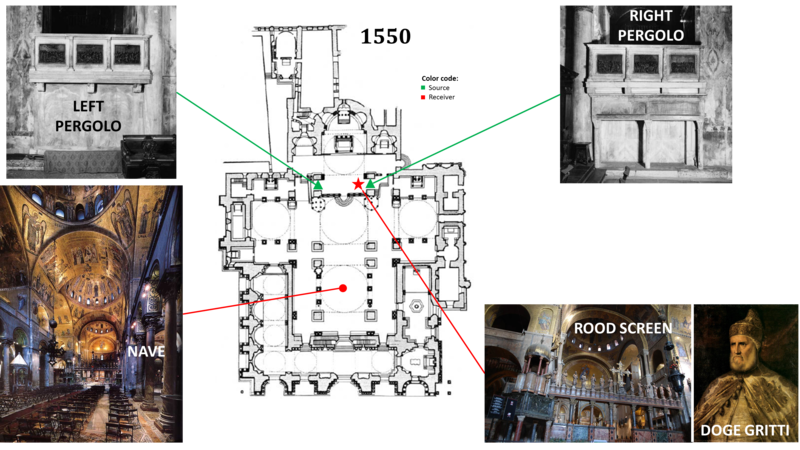 There are various changes one can do to an audio signal – some of them are to introduce delay, reverberation, amplification, echo, etc… We mainly decided to focus on reverberation and amplification as these effects were the most pertinent to describe the impact that a structure like San Marco may have on the sound. To estimate the parameters of these two effects, we used the knowledge of the dimensions of the interior of the church as well as Boren’s results. We used Laura Moretti’s soundtracks (from the CAMERA project, available on this website) as input to Audacity and obtained modified sounds which were to be considered for the timeline. Here, in 1530, the choir was still singing from a location behind the high altar. We consider the differences in sound quality received at the Doge’s position in the bigonzo and that at the middle of the nave, where the audience would sit. In 1540, Doge Andrea Gritti, encumbered by excessive obesity, was not able to occupy the usual elevated position at the bigonzo, and was forced to move down into the chancel next to the rood screen. A part of the choir had also shifted to the right pergolo to perform coro spezzato (that had been newly introduced by Willaert in Venice). In 1550, Sansovino had added a second pergolo directly opposite to the first one. This was done so that the Doge could now better appreciate the performance of coro spezzato at his location. This is the situation in 1600, 30 years after the death of Willaert and Sansovino. Coro spezzato had presumably become less fashionable then and the choir now sang from the bigonzo, outside the chancel. The sounds that were generated by us for each of these time-points were concordant with the results of Boren’s work. 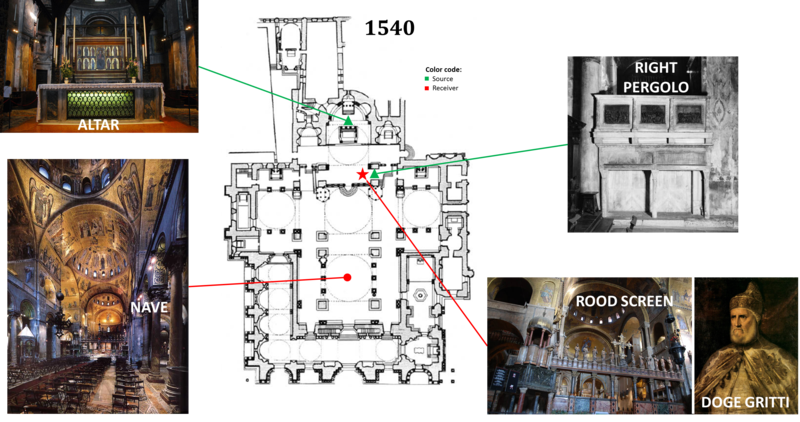 These sounds will be integrated to the final timeline that we construct so that the user can easily compare the aural impression perceived at different points within San Marco in the 16th century. As far as the construction of the timeline is concerned, we found a website that allows us to create a customized timeline along with hyperlinks to images or sounds that would be ideal for the application we have in mind. We also plan to set a meeting with our supervisor in the coming days to confirm whether our results are suitable for the final presentation. As a final statement of the status of our project – the results and information are ready, and now just need to be represented on the timeline for a user-friendly depiction of the insights we have gathered over the course of these two semesters. 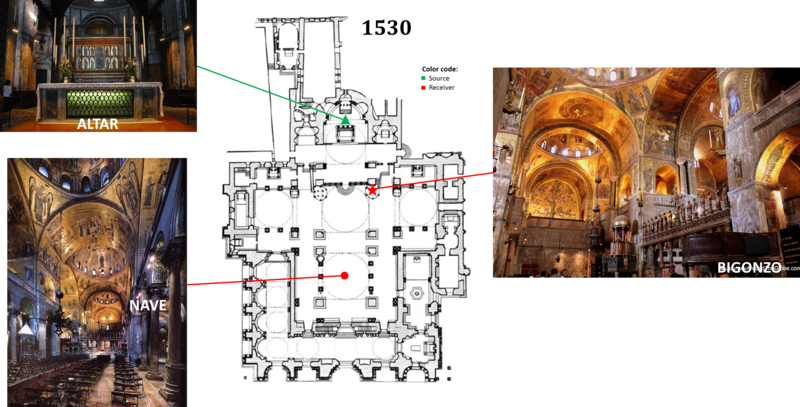 It seems that we finally have relevant data to fulfil our initial goal that was to show the user how music at San Marco actually sounded like in the 16th century.